There are people who swear behind a password manager (and we’re one of them) and others who think to store all your passwords, logins and personal info, in one database, is asking for trouble. They could be right. Without pointing fingers, a few popular password managers have been hacked and data leaked in the past, although as your data is highly encrypted, it’s unlikely to be cracked. You could simply write down all your passwords, offline. We know people who have done this (including bank login information), but if this is stolen, then you lose everything. The benefits of using a centralized password manager certainly outweigh the cons. Install a password manager across your devices and you’ll find your login information is synchronized and you won’t need to remember your data. Indeed, if you link your password manager to your browser, it can be used to auto-fill the relevant data on each website, without storing in the web browser itself (or you can use both methods). The question is, does the world need yet another password manager? The team behind the popular VPN, TunnelBear, think it does and has released RememBear for Windows, Mac, iOS and Android devices. You can use RememBear to store login information and credit card data. There’s currently no identity support, which could be used to book plane travel, where you need passport data and other personal information. RememBear is currently completely free, whilst in beta. Eventually, there will be a paid Premium version with additional functionality. It looks very similar to Dashlane to us, which is no bad thing. There are also plugins for Chrome, Firefox and Safari. 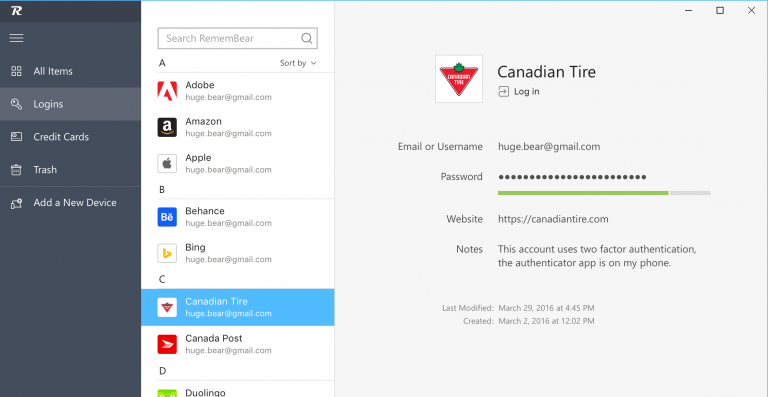 Hard to recommend RememBear, yet, simply as there are so many alternatives such as Dashlane, LastPass and our favorite, 1Password. There’s also the free Buttercup and KeePassXC to consider. Download RememBear for Windows, Mac, iOS and Android devices.